This is the second advance reading copy edition of Sacred Clowns. 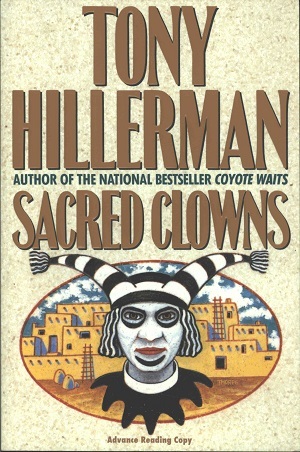 The eleventh book in Tony Hillerman's Navajo Mystery Series. This edition gives insight into a usually unseen process of promoting a book before publication. An advanced reading copy is the uncorrected proof that is distributed, without charge, to: journalists, book sellers, and celebrities for review and for promotional purposes. This is usually done a half a year in advance of the book release, both so any issues can be corrected and so any celebrity endorsements can be printed on the dust cover. Unlike the first advanced reading copy, the cover of this copy looks exactly like the first edition of the book, complete with an identical cover illustration by Peter Thorpe. Binding: Full-colored paste board covers. The cover is identical to the first edition with the addition of ADVANCED READING COPY. The author, a miniature image of the cover art, title, and publisher's logo are printed vertically on the spine.